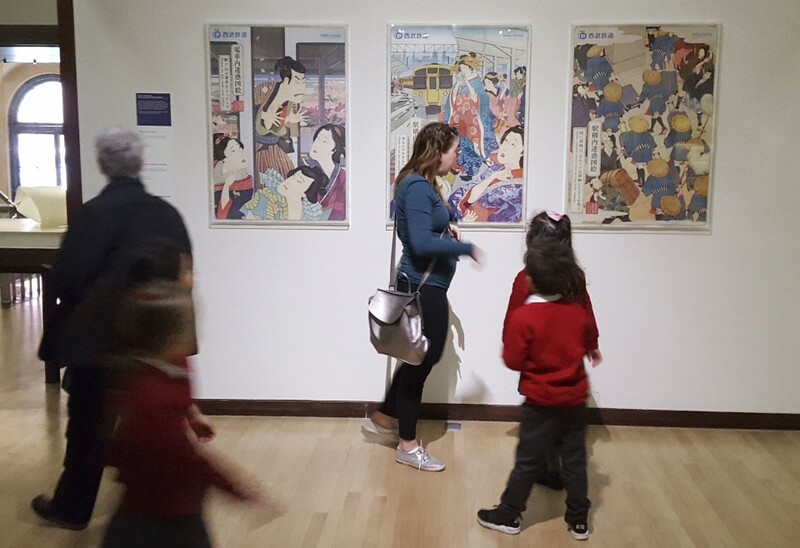 Posters that use traditional kimono-wearing ukiyo-e Edo Period characters to educate train passengers on proper etiquette have gained attention abroad, being featured in a British exhibition and printed in Taiwanese textbooks. First introduced in September 2016, the light-hearted, yet educational posters can be found in train stations operated by Seibu Railway Co. in and around Tokyo. The ukiyo-e art form traditionally depicts scenes of Japan's Edo Period (1603-1868). 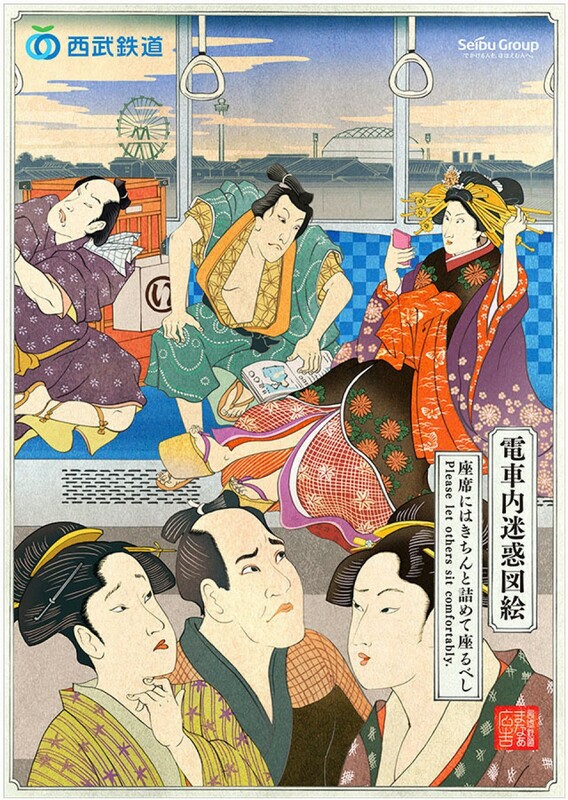 One image shows a courtesan sitting on the train while using a smartphone while a man with a topknot lounges next to her with a book on his lap. The surrounding passengers are depicted looking on in annoyance with text reading, "Please let others sit comfortably" written alongside. 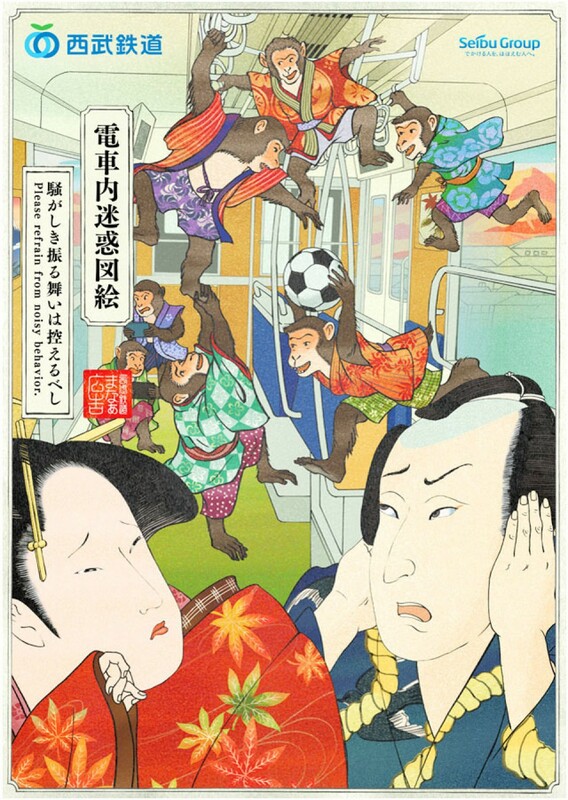 The cultural reference points are used in a range of posters, including one asking commuters to be thoughtful of fellow travelers by depicting an anthropomorphized frog and monkey talking loudly as passengers cover their ears in protest. The posters were an immediate hit when they were revealed at Seibu line train stations in 2016, with some passengers asking that the images be sold on merchandise. London's famous Victoria and Albert Museum began exhibiting the posters in March, noting the interesting amalgamation of tradition and modernity. "The posters illustrate the bustle and thrill of city life in modern Japan. Humor tempers the message about how to be a well-behaved commuter," it says on its website introducing the pieces. A company running cram schools in Taiwan also included the images in their Japanese language textbooks. "We wanted to attract interest from the growing number of overseas visitors," said Seibu Railway customer service official Konomi Yamamoto, who proposed the original idea. 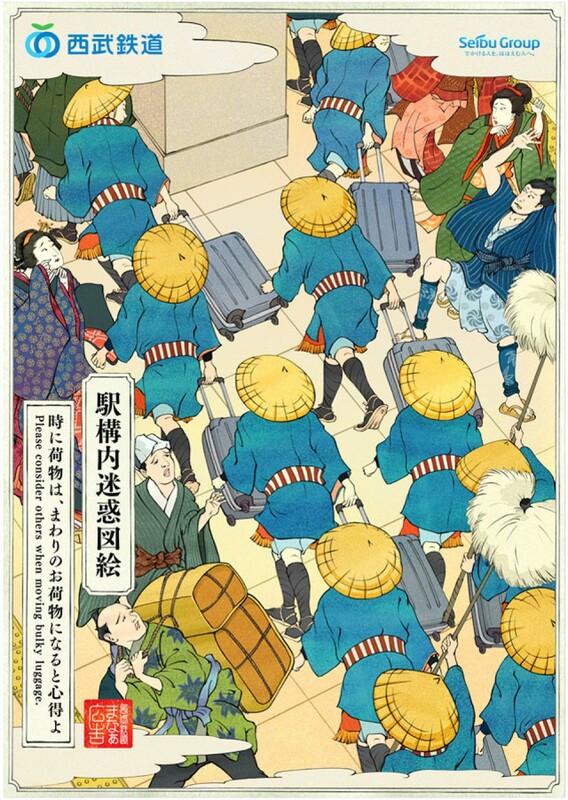 "We were able to depart from stereotypical posters by making (the ukiyo-e) appealing. I'm surprised by the overwhelming international response," she said.